In 2013, three Hunterdon County communities — Lambertville, Stockton, and West Amwell voted to consolidate what had been four school districts (they already shared a grades 7-12 secondary school district) and combine into one district, South Hunterdon Regional. The regionalization actually took effect beginning July 1, 2014, at the beginning of the new fiscal year. If that sounds unexceptional and ordinary, it was anything but. Despite the regular discussions which occur at both a statewide and local level about the potential financial advantages of regionalization — and the preliminary moves many districts have made toward such an action, the South Hunterdon formation was the first successful regionalization of school districts in New Jersey since 1995. That was the year when the Great Meadows Regional School District in Warren County was created; the district serves elementary school students from Liberty Township and Independence Township. Currently only 92 of the state’s 574 operating school districts are regional, consolidated or merged systems, comprising two or more municipalities. Regionalization is often touted as a cost-savings measure for property-tax-weary New Jerseyans. But there are steep built-in obstacles to regionalizing. A majority of the voters in each of the communities must approve a regionalization proposal — and the complexities of tax apportionment often mean that property taxes in one of the communities often are slated for an increase after regionalization. Overall operating costs for the combined district can actually increase, as state law requires that when existing districts are combined, the salary guide and the terms and conditions of employment in the regionalized district be that of the “largest” constituent district — the one with the most teaching staff members — prior to consolidation. Also, the demographics of a combined district may actually prevent that regionalized district from receiving certain federal or state aid that one of the constituent districts may have qualified for prior to regionalization. So how did South Hunterdon manage to pull it off? How has the regionalization worked, nearly five years after the successful vote to approve it? School Leader spoke with three people who were instrumental in both the regionalization and in the successful unification of the districts: Dr. Louis T. Muenker, the current superintendent of the district (who previously served as superintendent of the grades 7-12 school district); Jim Gallagher, current South Hunterdon board president, and previously a member of the Stockton board; and Dan Sieter, the chair of the regionalization committee and a current member of the board. Note that the companion article to this one, authored by one of the South Hunterdon attorneys, Kerri Wright, provides valuable details about the all-important legal and financial aspects of the regionalization. It begins on the opposite page. In 2008, after a few years of even more intense discussion about the topic, the four boards — Lambertville, Stockton, West Amwell, and South Hunterdon Regional High School each unanimously passed a resolution that declared their intent to find a path forward to regionalization. Boards began to regularly place the topic on their monthly board agendas, to discuss the subject. A regionalization committee was formed, comprised of board members, council members and some community members. Three years later, the boards decided to fund a feasibility study, which is required before a regionalization, through a referendum. The South Hunterdon High School District put a proposal out to the community to borrow $50,000 for the study (which ended up costing about $44,000). Putting the question out to the community accomplished two goals: It funded the study, and it helped gauge how interested the communities were in regionalizing. The vote to fund the study passed, although ironically, that year’s proposed budget for South Hunterdon High School district was defeated. The Rationale Behind Regionalization While the financial benefits are often the first to come to mind when a regionalization is proposed, in the case of South Hunterdon, the educational benefits were at least as important — and perhaps more so. The three elementary districts, which all fed into what was then the South Hunterdon Regional High School district, serving grades seven through 12, did not always coordinate their curricula as well as they could have. Students sometimes reached the common secondary school with different levels of preparation. “As much as districts attempted to coordinate and talk, there are limited opportunities for them to do so because districts are strapped for time, especially during in-service days,” says Muenker. The Importance of Community Relations The regionalization committee, and the boards of the districts, made an enormous effort to reach out to the communities to inform them and answer any questions. “We knew we needed public buy-in,” said Gallagher. “We initially had meetings among leaders of the different school boards to talk. At some point we drew up a frequently-asked-questions document and had it published in the Lambertville Beacon.” There were town meetings, a big meeting at the high school, letters of support published in the newspapers that were written by former board members and local mayors, informational mailings, and door-to-door canvassing to solicit support. “When we were communicating to each community, this wasn’t a financial story. It was very much around what is the broader benefit for each of the individual communities,” said Seiter. “ We also stressed how communities would retain their own identities.” One easy assurance the regionalization committee was able to provide to the communities: The individual schools would all retain their chosen school colors and mascots. Another message that the proponents stressed was that there would not be immediate drastic changes in the district. “We assured the community that if this passed, there would be no material change in the structure of the district until the community had an opportunity to come together and help decide what those changes should look like,” said Gallagher. The Regionalized Staff The greatest fear of the staff, understandably, was that jobs were going to be cut. “We made promises to our staff that for the most part, things were not going to change,” says Muenker. Muenker became the superintendent of the new district; while the then-Stockton superintendent was retained as the principal of that school and took on some additional administrative duties. Both the business administrator of Lambertville and the shared superintendent of the Lambertville and West Amwell districts ended up leaving the district, at a cost savings to the regionalized district of about $280,000. There were some transfers of support staff, but no layoffs, and there were no layoffs of teachers. One of the largest hurdles was to merge the salary guides for all the districts into one new schedule. “Tiny Stockton Borough didn’t have a salary schedule,” said Muenker, “there was a listing of the four or five teachers with written salaries associated with them.” At the time of the regionalization vote, Stockton had only about 53 students and had 4.8 teachers (when measured on a full-time equivalency basis). Another challenge was merging four board policy manuals. “Even though there was a lot of redundancy and similar wording, it took 18 months to read through all the policies from the four districts and get a new policy manual in place,” said Muenker. NJSBA’s Legal and Labor Relations Department provided extensive assistance to the district during the regionalization process. There wasn’t even a clear timeline as to when the new district should begin operations and the older districts dissolve. But the board set a goal of starting official district operations on July 1, 2014, and opening schools as one district that September. “We repeatedly said the whole process was like sculpting fog,” said Dan Sieter, the consolidated board’s first president. The Results of Regionalization While there have not been tax cuts as a result of the regionalization, there have been some cost savings. One unexpected area of savings has been in employee benefits. Since the district now has more employees, they have been able to get more bids from health insurance providers who previously weren’t interested in bidding on the business of the smaller, individual districts, when they had a smaller workforce. South Hunterdon saved about $1 million over a few years on its health care benefits costs by switching to a different provider than they had previously used. The district has also had incremental savings doing things like merging banking services and landscaping costs. A Template for Future Regionalizations? South Hunterdon may have been exceptionally well-suited for regionalization — three communities that were geographically close, fed into the same secondary school, had fairly similar populations, some declining demographic projections, and a long history of sharing services and informal conversations about consolidation. But there are lessons in their experience. First, the process will be longer, and more difficult than anyone might expect. Good communications with your community is paramount. “You have to know your community and solicit their support first before starting the process, and you should not suggest there will be substantial cost savings,” said Muenker. Soon after Gov. Phil Murphy took office this year, his education advisors contacted the New Jersey School Boards Association with a request. Could the Association summarize what obstacles to school board regionalization exist? 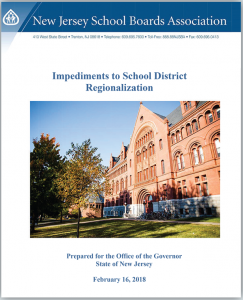 The resulting report, “Impediments to School District Regionalization,” can be accessed on the NJSBA website.